Support and resistance lines conform the most basic analytical tools and are commonly used as visual markers to trace the levels where the price found a temporary barrier. In other words, where price had trouble crossing. 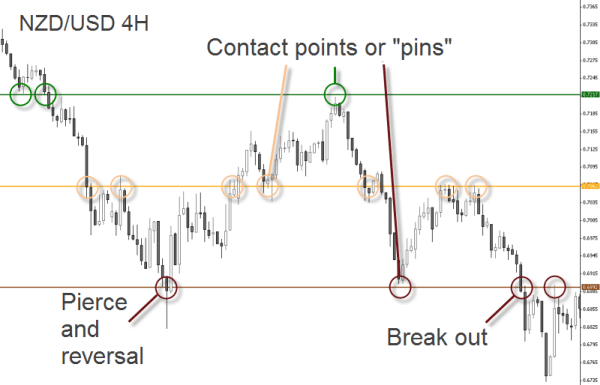 From a strategic point of view, support and resistance levels represent smart places to anticipate a reaction in the price of an asset, and therefore represent a basic tool in technical analysis. Numerous traders use them, but the diversity in application and integration tell us that charting is definitely not an exact science and more of an art. One of the most common mistakes that new traders make is buying too close to a line of resistance or selling too close to a line of support. In this page we provide enough set-ups and real time examples, to make sure you thoroughly understand this simple yet important dynamic. Don't be disappointed if S&R lines haven't worked for you until now. You see, in reality, support and resistance are price zones, not exact numbers. This is clearly visible when switching from a higher timeframe to a lower one: an horizontal line on a weekly chart can perfectly be made by an horizontal price channel on a one hour chart. This is why it often what appears to be a break of a support or resistance level is just the market testing it. These 'tests' of support and resistance are usually represented by the candlestick shadows piercing the S&R levels. If the market were made by S&R lines and not by people, then the exchange rate would always rise and fall to the same exact price points, over and over again. But because that rarely happens it's important to think of support and resistance as zones on the chart where people buy and sell. One way to induce the habit to treat S&R lines as zones is drawing them with fat lines, avoiding a fine-point trace. That way you won't fool yourself into believing you have identified the exact price at which a currency pair is going to turn around and start moving in the opposite direction. And even better: draw the lines, especially the horizontal ones using two lines, an upper and a lower one, or use rectangles to mark the zones. Your chart platform has all these fancy tools for sure. There where the difference between the number of buyers and sellers get more remarkable, it tends to form a Support or Resistance level. Your next logical quest will be to identify them on a price chart. Historical and potential levels, can lead to several constructs: horizontal lines and dynamic trendlines are the most used ones and can be based on significant highs and lows. Lines are also used to delineate price channels as well as classical chart figures such as triangles and wedges. Some technical indicators can act as potential levels, such as sentiment chart, moving averages, Pivot Points and Fibonacci cycles which are commonly used in Elliott Wave analysis. Round numbers - those quotes ending in 00 or 50- and emotional spikes are often perceived as Support and Resistance levels. When these levels encompass a larger area on the charts technicians speak of a Support and Resistance Zone. Once the market moves into consolidation and VWAP flattens out, it can be used to highlight really powerful support and resistance areas by tracking price against the standard deviations of VWAP. Trading the synthetic pair can be extremely profitable if done properly. Though there are many different ways of trading the synthetic pair.